where they go, and where to see them. Gray Whales are one of the oldest species of mammals on the planet, having been around for over 30 million years. And the Gray Whales are among the largest of the Earth’s animals, checking in at up to 50 feet long and 40 tons for an adult. (Blue whales take the prize for the largest at about 90 feet long and weighing 200 tons!) The whales can live for 40 to 50 years. Amazingly, gray whales migrate from Mexico to Alaska and back every year, sticking close to the coastline – less than 2-1/2 miles from shore. Therefore, we have the incredible opportunity to see these ancient, majestic, and fascinating creatures right off of our own Mendocino Coast. And the gray whales are just a short walk away from the Alegria Oceanfront Inn and Cottages. Gray whales are baleen whales. In place of teeth they have a thick comb made up of long, fine hairs called baleen which they use to capture food. 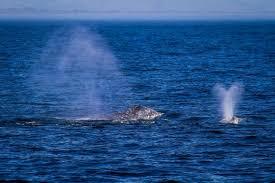 Gray whales have two blowholes piped directly to their lungs. That means the whales can breathe and eat at the same time! That comes in handy, since an adult gray whale can eat as much as 2400 lbs of amphipods, plankton, tiny shrimp, and cumaceans per day while in the Arctic feeding grounds. Diving to the muddy bottom, gray whales scoop up sediment from the ocean floor, filtering out water and mud and trapping plankton and krill. The whales don’t do a lot of feeding while migrating, but will eat squid, herring eggs, krill, and shrimp when available along the way. Gray whales have the longest migration of any mammal Their migration is between 10,000 and 12,000 miles round trip every year from the winter calving lagoons in the warm waters of Baja California, to the summer feeding grounds in the cold Arctic Seas. The migration takes a whale about 2 to 3 months traveling at an average speed of about 5 miles per hour. The northward migration (January to June) is led by adult males, newly pregnant females, and juveniles. Mothers with calves stay in the warm Baja waters to rest and gain blubber for the long trip north. The southward migration (October to February) is led by pregnant females, followed by males and other adult females. Juveniles come last, but some don’t even make it to Mexico before turning around and joining the northward progression. Here on the Mendocino coast of California, we can usually see whales from late November through May. February is the start of the best part of the year for watching the Gray whales migrate. Thanks to their nearshore migration, they are easy to spot from shore. Starting with the closest whale watch venue, we have seen distant whale spouts right in our own Alegria dining room, from our garden deck and especially the Sea Breeze and Pacific Suite decks. 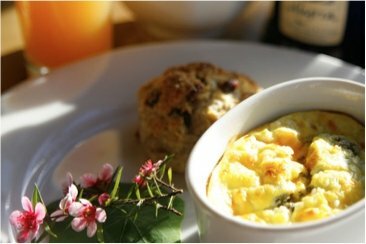 At a minimum, discuss the day’s whale watching plans with the other guests or the staff at Alegria. 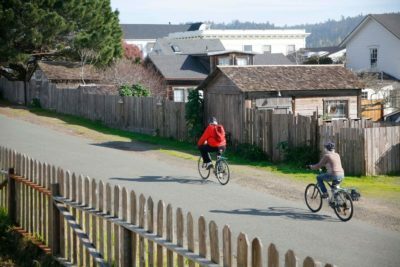 In Mendocino, start at the Ford House Visitor Center and Museum just a few blocks from Alegria Inn. Inside are knowledgeable docents to give you whale watching tips. Check their calendar for Whale Walks and Talks. And visit the museum’s natural and human history displays, bookstore, and picnic grounds. A hidden little gem is our favorite bench on the back porch. A nice warm spot for gazing at the ocean or having a little picnic. Stroll down Main Street as you go gallery hopping and you are liable to spot some whale spouts. Drop into Out Of This World on Main Street and shop for new telescopes, binoculars, and spotting scopes to help you view the whales and other wildlife. Take a look through the telescopes that are set up in the window and you may see a gray whale! The staff often have the latest info on where the whales are being found and advice on how to spot them. Continuing on, you arrive at the beautiful open space of the Mendocino Headlands State Park. 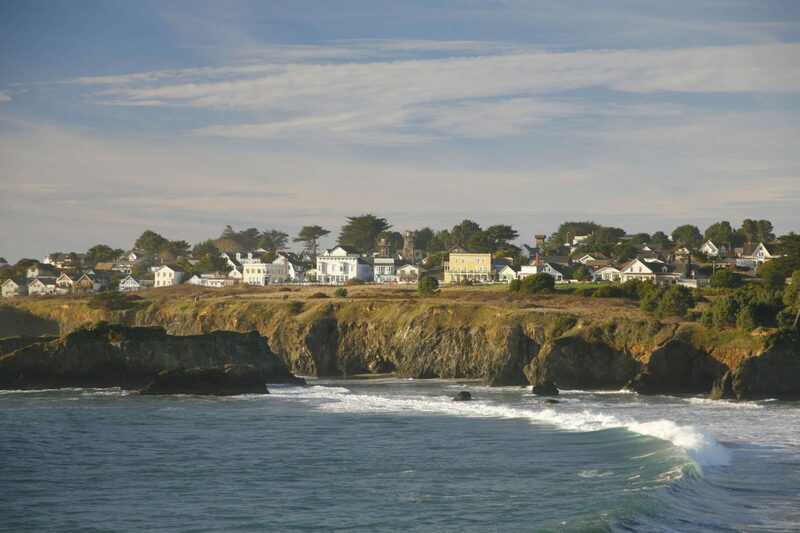 The park features cliff top trails all around the peninsula that Mendocino is situated upon. Walk along the trails, keeping an eye out for whale spouts. If you don’t see any spouts, keep walking until you hear other visitors and locals shout “I see a spout”. Follow their pointing fingers and you will probably see spouts too. When you see a spout, just keep looking near it, and you may see a spout from the same whale, or one of its travel companions. And if you are lucky, maybe a back, flipper, or tail! The trail all the way around the headlands and back to Alegria is about 3-1/2 miles. Restrooms are available on the north side of the peninsula. 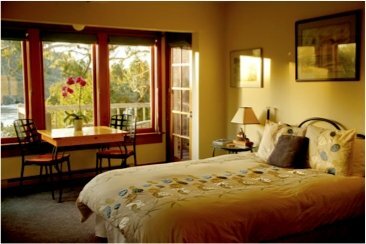 Just a few miles north of Mendocino is our spectacular vacation home rental The Dolphin House. If you stay at the Dolphin House, you get full time views and whale watching opportunities from nearly every window and both decks! Perched on a bluff and just yards from the cliff top, there is nothing except you and the ocean. Get your snacks, pull up a chair, and prepare to see whales. Or try a visit to Point Cabrillo Light Station State Historic Park about five miles north of Mendocino. There are usually docents on hand to help you spot the whales and answer questions. Plus there are restored light keeper homes, a marine science exhibit, museum and gift shop. And of course beautiful ocean views. A bit further north is the Mendocino Coast Botanical Garden where you can not only see beautiful gardens, but whales too! Walk all the way to the west to see a spectacular ocean view and maybe some whales! We hope to see you during whale season through April. Check our Availability and start planning your trip!